Decorations Today, decorating for a wedding and reception offers a variety of options. 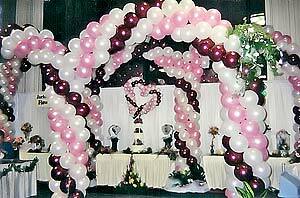 Balloons, bows, tulle, candles, mini-lights and flowers can be used to create any style or theme a couple may desire. Whether the couple wants to do-it-themselves or hire a professional, there are many decisions to be made and like all other details of the wedding, careful planning will help to alleviate any last minute rushing and worry. Reception décor begins at the front door, decorations to denote "the party is here"! The guestbook table (or podium) can be easily dressed up with coordinating ribbon, bows, tulle and tastefully sized balloons. The gift table will need to have room for the gifts so decorations can be applied by adding a drape of greens and flowers, or tulle and lights around the outside edge or a balloon arch behind the table. Likewise, the cake table can be decorated, but the not over-done, as the wedding cake itself is the focal point of this area. Favors are small tokens of appreciation that say "thank you" for attending. Favors are given to guests at many types of celebrations. At weddings, favors are usually associated with showers and the reception. These gifts can often be found in baskets by the entrance/exit or at sit-down events placed on the table at each place setting. Choices and ideas for favors are limitless. The most common favors for weddings include nuts/mints wrapped in tulle, boxed individual pieces of chocolate, votive candles, CDs and flowers. Sometimes favors will incorporate wedding colors, the bride and groom's name or other information that makes them a personalized momento. Favors and supplies can be found at a variety of businesses, from those who specialize in creating unique favors to shops that carry or can order personalized trinkets.